Coconut cake with lemon curd filling, so moist and old fashioned. Prepare pans by buttering and flouring. Additionally, you might want to use parchment paper to line pans. Add sugar, and cream for two more minutes. Mix together and sift, flour, baking powder, baking soda and salt. Add flour mixture and buttermilk to sugar/butter mixture in stages, beginning and ending with flour mixture. Add in coconut (optional). Prepare egg whites, by beating with electric whisker until foamy. Add in cream of tarter and beat until soft peaks are formed. Incorporate egg whites into cake batter, gently, so as not to deflate. Immediately place into prepared pans. You can use 2 pans or three pans for either a 4 layer or 3 layer cake. If making a four-layer cake, use serrated knife to cut each cake in two. Bake at 350 for 25-35 minutes, depending on how many layers you use. Three layers will take less time. Lemon Cream Cheese Frosting Ingredients 12 oz. cream cheese 5 tablespoons unsalted butter ½ teaspoon salt (leave out if using salted butter) zest of 1 fresh lemon 5½ cups confectioner’s sugar 3 tablespoons heavy cream (or 3 tablespoons of fresh lemon juice) ½ teaspoon of lemon extract or 3 tablespoons of fresh lemon juice in place of heavy cream 1 cup coconut for decoration Instructions Mix butter and cream together until thoroughly mixed. Add vanilla. Slowly add confectioner’s sugar a cup at a time. Once fully incorporated, add heavy cream. If using lemon, mix lemon zest with confectioner’s sugar with your hands. Add lemon juice instead of heavy cream. Assembly Once cakes are cool, use serrated knife to even the tops. Freeze for 30 minutes. Once frosting is made, top with a plastic wrap touching the frosting and set aside. If frosting is made a day in advance, take out 30 minutes prior to using, and remix with mixer. Use lemon curd for filling between layers. Frost with cream cheese frosting. 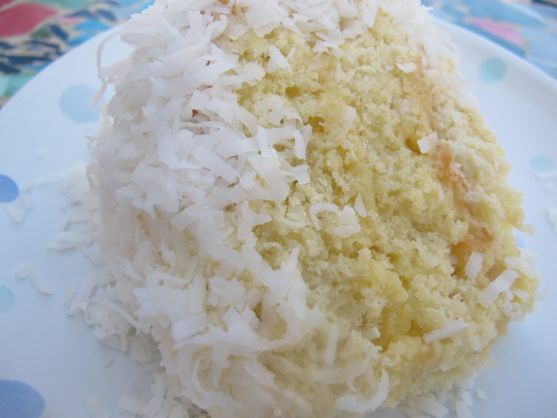 Cover entire cake with coconut.